Eleven years ago, a young Kristy Wright [ above right ] said a very painful goodbye. 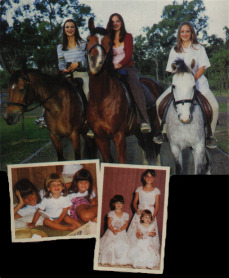 Her father Michael made the decision to move from Sydney to Queensland, taking Kristy's half-sisters, Chantelle and Melissah with him. Kristy recalls it being one of the saddest moments of her life.
" It was a very hard time ", says Kristy, who remained in Sydney with her mum, Kerri." The girls were very small and I'd always wanted to have sisters, so it was hard to see them go. I really felt like I aws losing them ". As it turned out,distance would do nothing to keep this attractive trio apart. Along with father Michael and their mum Cathy, the younger Wright girls settled near Proserpine, in the Whitsundays. Kristy became a regular visitor and over the years all three became firm friends.
" She's more of a friend than a sister ", says Chantelle now 13." She's lots of fun and always there to give good advice ", 16-year-old Melissah adds." We talk to each other on the phone all the time ". While beauty definitely runs in this family, Kristy says their personalities are actually quite different." Melissah and Chantelle are chalk and cheese and I'm different again ", Kristy says. Melissah is the introvert-she deals with things internally. She likes to read and write and has always been good at school. Chantelle is the exact opposite-she really hates school and lets the world know what she's feeling and thinking. She's highly opinionated and has no idea when to be quiet at all!
" Actually, come to think of it, I'm probably a combination of the two. We're all different ". " No, Kristy's the strange one ", Melissah laughs. " But it's okay-we put up with her ". Both Melissah and Chantelle also had to put up with a lot of unwanted attention when Kristy first rose to fame playing Chloe Richards on Home and Away. " I got hassled a bit ", Melissah recalls. " Everyone would come up to me at school and say'Ha ha! Your sister is on Home and Away'. But mostly they're good, just wanting to know what people are like ". Kristy's success has been an inspiration to both her sisters. Chantelle hopes to be an actor, while Melissah has her heart set on a career in journalism." i'm sure they'll achieve what they set out to ", Kristy says." They're both very talented. I'm hoping as they get older they'll be able to come and visit me in Sydney more often and I'll be able to help them out. They might even move down later on-who knows?" In the meantime, the Wright sisters are content to spend whatever time they can together doing the things they love. As the pictures show, horseriding is a favourite pastime." We love the horses, and also going shopping or swimming and snorkelling ", Chantelle says." We manage to pack lots of things in when Kristy comes to visit ".